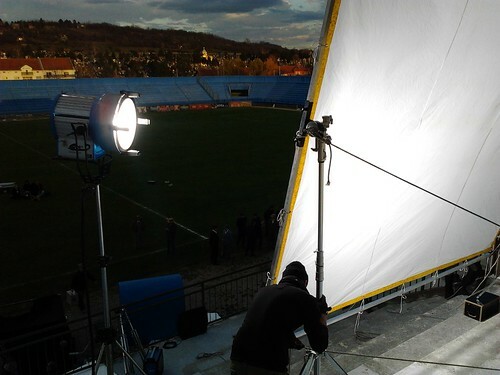 Last weekend the crew from the Serbian film, Montevideo, took advantage of the warm weather and finished filming some of the soccer scenes at the stadium in Paracin. The sun came out during the afternoon. Although it was much colder than this summer, it was nice to be back. I had to shoot a couple of the transition scenes. The film is still in post-production and will hopefully come out this spring. The first Montevideo: Bog Te Video (God Bless You) was one of the biggest Serbian films in recent years. It is incredible the amount of time and effort the directors have put into getting this film right. I admire their attention to details in even the minor scenes. I’ve gained a new appreciation for the craft of movie making and I promise never to buy a pirated film again. They work too hard not to get the full financial rewards of their work.